Apropos. The first day of April was dreary and rainy. Hopefully this isn’t a sign for things to come, because it’s going to be a great month, I can feel it already. Food: 101 in 1001….keep on truckin’! Try 4 new-to-me recipes. Including meatloaf. SKYDIVING! Per the bucket list (and the 30 before 30. I like lists. Don’t hate), I’m going skydiving at the end of the month. Some friends and I got a groupon (super great deal! ), so we’re going to jump out of a plane! Finances: Start my Roth. For real this time. Also, I need to get my accounts back in order post-car buying extravaganza, and set new savings goals and spending limits. Work out: Run twice a week. Swim once. Yoga class once. Abs 4 days a week. Climbing: I bought climbing shoes, so now I have no excuse not to go climb. Often For you outdoor enthusiasts, check out steepandcheap.com. I got a great deal! I wanna know: what sort of awesome-ness is happening in your world this month? I’ll finish my kitchen this month. And will finally pay off that kitchen table. And hopefully do more reading than I did in March. I’m switching up my work schedule to make more time for priorities, like whole-food cooking, family time and maybe (gasp!) practice time. Last but not least – I think I’m going to try to remember 6th grade art class and try my hand at watercolors. I’ve got plans for something pretty to decorate the walls of my bathroom. sky diving?! You’re crazy! 🙂 Can’t wait to hear about it! I’ve wanted to go skydiving, but I just haven’t brought myself to doing it. 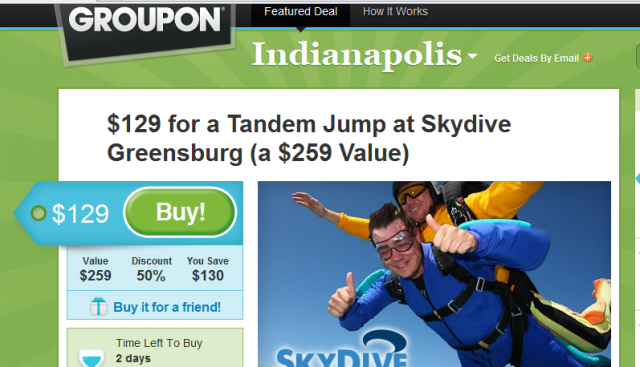 I always see Groupons and such, but I don’t know, maybe it wasn’t meant to be. 😉 At least not anytime soon. Happy APRIL.